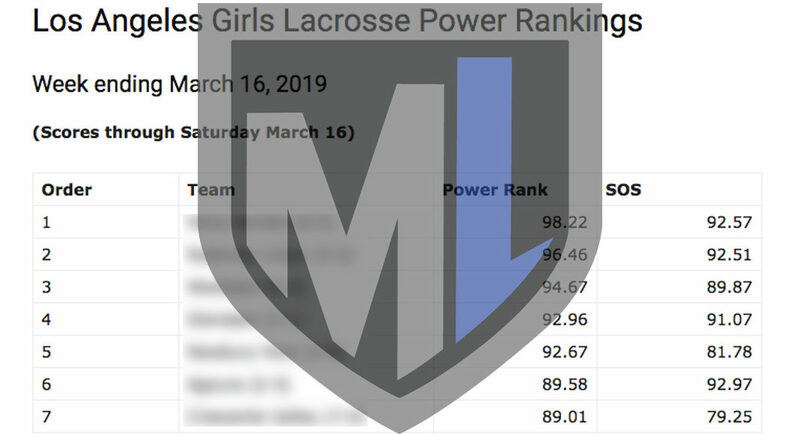 In the initial calculation, run before Monday’s games, the top of the MaxLax LA Girls Lacrosse Power Rankings looks remarkably similar to the coaches poll Top 20 released Monday, with Palos Verdes, Redondo Union, Westlake and Glendale ranked Nos. 1 through 4. The algorithm did produce a couple of interesting rankings that deviate from the coaches poll significantly. Newbury Park, for example, is No. 9 in the coaches poll but No. 5 according to the power ranking, although it should be noted the Panthers (2-0) showed only two game results through Saturday, when the calculation was made. Friday’s home game against No. 3 Westlake should provide more insight into the Panthers. Marlborough, too, is rated much higher by the algorithm at No. 8 than by the coaches poll, which has the Mustangs (2-4) ranked No. 17. Losses to Westlake, Glendale, Crescenta Valley and Chaminade — all Top 10 in the power ranking — prevented Marlborough from dropping far in the calculation. In contrast, three teams ranked in the Top 15 of the coaches poll were ranked lower by the algorithm — Oak Park, Downey and Palisades. The complete MaxLax LA Girls Lacrosse Power Rankings are available here, with a MaxLax subscription.